The night after my marathon I had trouble sleeping, my leg muscles were twitching and I just could not switch off my brain. I think the calls with my Mum and Hubby had made me a little homesick and the temperature in my room was boiling (with no fan), and a thousand bitey insects kept buzzing past my ear. Eventually i dragged myself out of bed at around 6.30am and checked my phone for bookface updates. I was completely overwhelmed to see that more than 200 peple had ‘Liked’ my post and photo from the marathon finish line, possibly the most poplar post I have ever (or will ever) have. I was feeling the love. Thank you all for being so supportive of my journey. A runner often feels very alone but at times like this you realise just how many people you can reach who care and support you in these conquests. I had been feeling so down and you all cheered me up immensely. I met up with James at Joe’s garage for breakfast and we also ran into some guys from Auckland who I had run with during the race the day before. They asked me what I thought of the race and all I could conjure up was ‘Brutal but Beautiful’, and they agreed. We chatted and finished our breakfasts then went our separate ways. Breakfast was delicious too, make sure you visit Joe’s Garage if you’re ever in Queenstown. 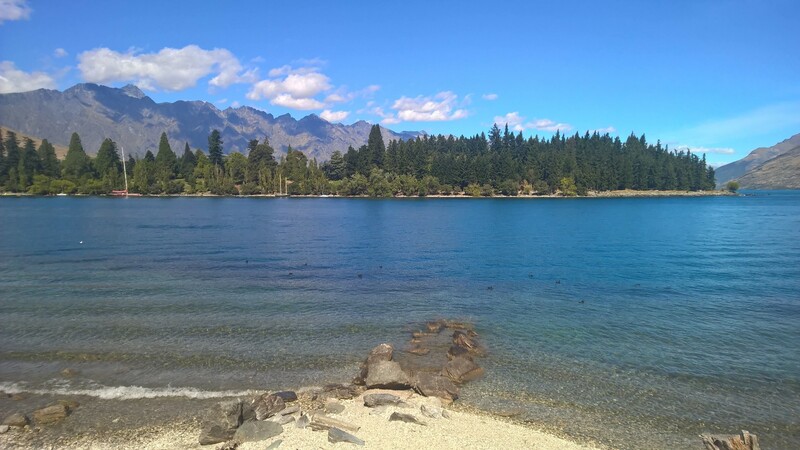 The weather was stunning and so I slowly strolled back to the Rydges hotel along the lakeside. I was lucky enough to run into Jill and her daughter and we had a quick chat about our plans for the next few days. When I got back to the hotel I washed all my clothes and packed my bag ready to check into a new hotel the day. After washing my gear I had a much needed nap in my roon, then headed to the world famous Fergburger. I took the burger and say by the water side (see below photo) and OHMMGEE!!! It was the best burger I have ever had. The meat just melted in my mouth and the sauce was divine. Definitely worth waiting in line for. I strolled back to the hotel and by this time it was late afternoon and so I took myself to the bar for a well earned drink. 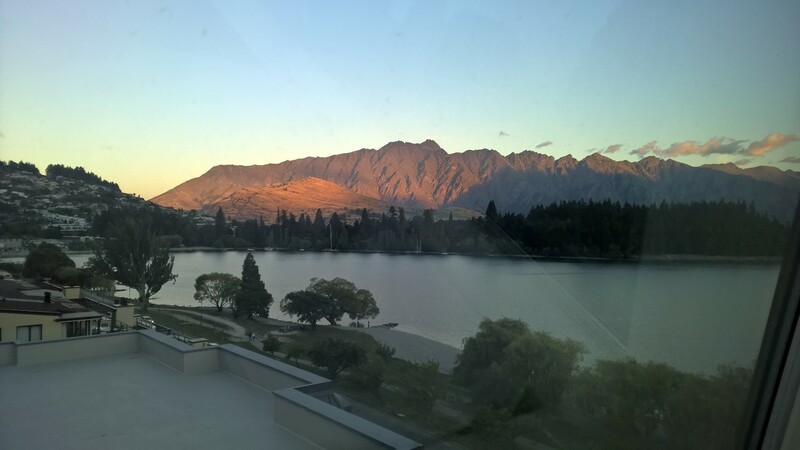 After the drink I took myself to the hotel restaurant and they gave me the best seat in the house so I could watch the sunset while I had my meal (see photos below). 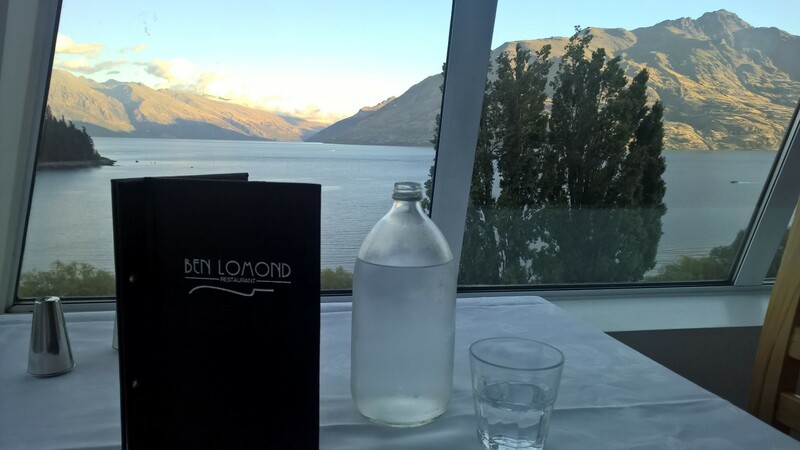 I had pork with apple sauce and vegetables as the Remarkables lit up in front of me across the lake. I downed a couple of reds with my dinner too and was feeling very tipsy by the time I got to my room, but it helped me nestle off to sleep nicely. The next day I got up and had my breakfast in the hotel, very expensive and not worth the money. I should have gone to Joe’s!! 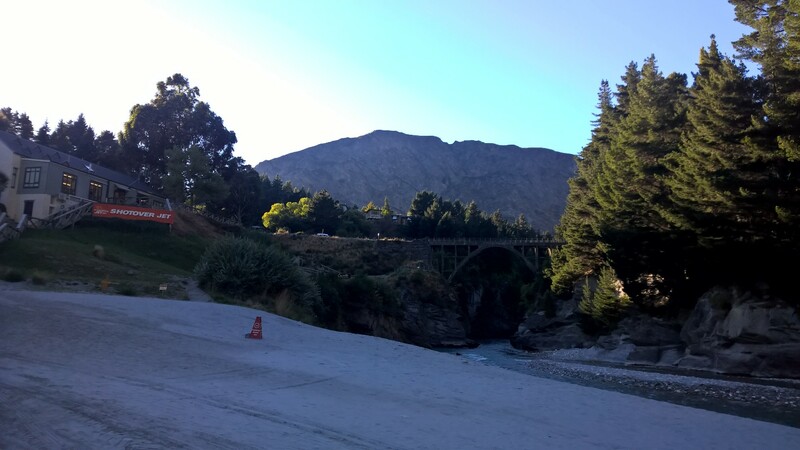 I scoffed down some food and made my way into the main part of town to wait for my bus to the Shotover Jet. On the way I went past the Fergbaker and bought myself a coffee, the only place open that early in the morning. Thankfully it was good coffee. 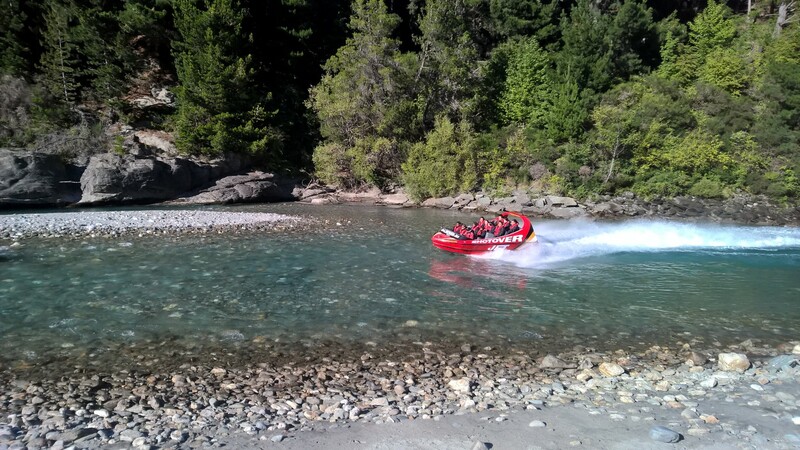 I then checked in at the adventure counter and eventually boarded the bus to the Shotover Jet which was only 10 minutes dive away. I had booked the Sunrise Jet at 8.15am (because it saved me $20) so it was quite cool even though the sun was shining. We met our captain Adam who would be driving our boat and I boarded the jet and sat in the second last row on the side. We set off and you could really feel the power of the motors as we skimmed across the water and did 360 turns. It was so much fun!! So much so that I ended up buying a second jet ride (for only $19) and did it all over again!! Woohoo!! I met the lovely girl (above) who spoke hardly a word of english, but i worked out that she was in New Zealand for Chinese New Year with her parents and having a great time! We smiled and laughed through the whole ride and her Dad took a photo of us (check out my cold, red nose! ha ha). 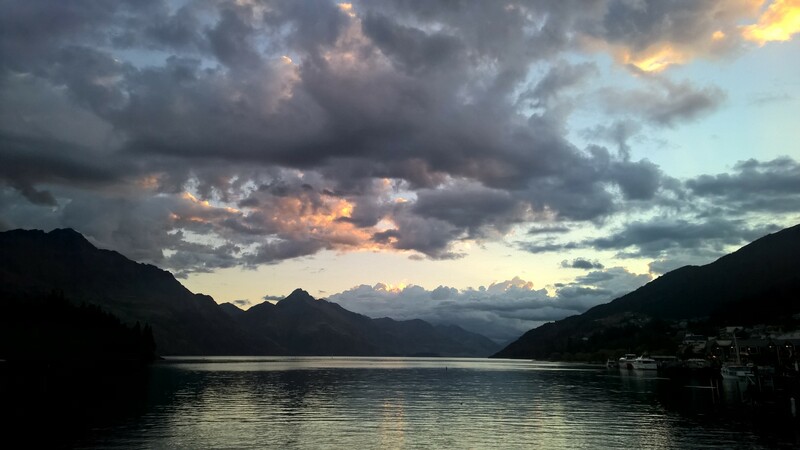 We got the bus back to Queenstown and i headed straight for my hotel to collect my bags, check out, andthen walk to the Nomads Hostel which were my new lodgings for the night. My broken suitacase wheel made the trip a little slow (and noisey) but eventually I got there, checked into my double room booked and was relieved to see I had my own bathroom too. The room was actually much nicer than what I’d had at Rydges, and less than half the price too! I then took myself to the Kiwi Discovery store to pick up my tickets and information about my trip and the lovely Sarah gave me my trek briefings. I took close note of everything she said as I had never trekked before and made a lit in my head of all the foods she recommended that I carry with me over the next week, then took myself to the grocery store to stock up on supplies. Did I mention that I was trekking Milford and Routeburn back-to-back? Yes, quite optimistic! After getting the groceries and having Subway for lunch I headed to my room to pack my trekking back pack ready for the next day’s journey. 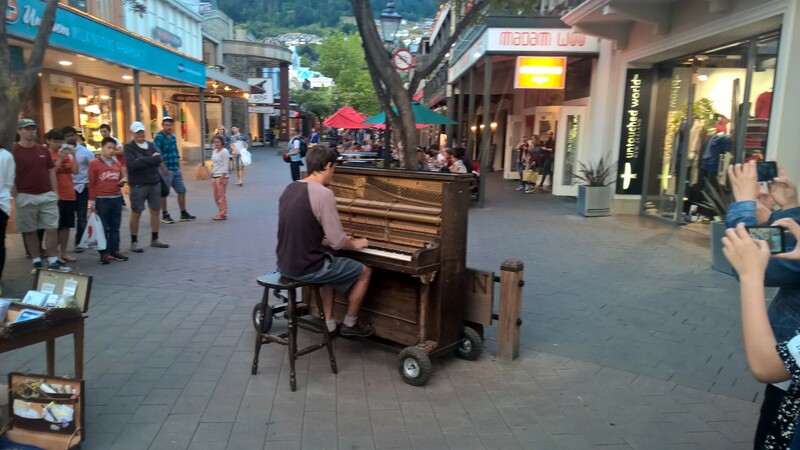 On the way through Queenstown I saw a gentleman roll his piano into the mall and start playing away, he was quite good. After stuffing everything into my bag and wondering how on earth I was going to carry this contraption I checked my phone to see I had a dinner invite from Jill for Fratelli’s. It was 6.28pm and she had said if i was free to come and meet them. So I quickly got my gear together and raced to the restaurant. They had just ordered so I added mine and we chatted about our days explorations. I had the spaghetti (for the second time) and we laughed and chatted about how Wes had gotten lost on his run up the mountain, and how Jill had spent hours looking for him with her 2 daughters, Ava and Jasmine. Eventually I had to say goodnight and we all hugged and wished each other well. I’m sure Jill knew I was feeling homesick and they made me feel like part of their family. I was sad to see them go but very thankful to have met them, and i knew I would see them again one day soon. I took a moment to sit by the water (see below) near my hotel as i soaked up the view before bed. 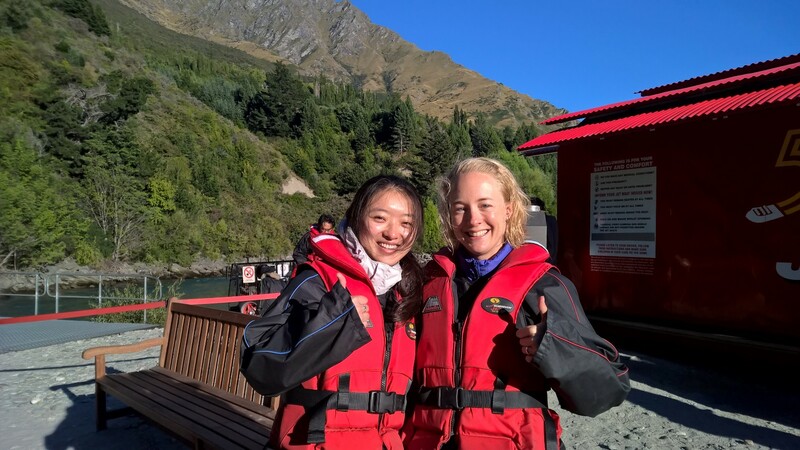 I had achieved and learnt so much in the past week and was feeling excited for my new adventure that started on the Milford Track the next day.